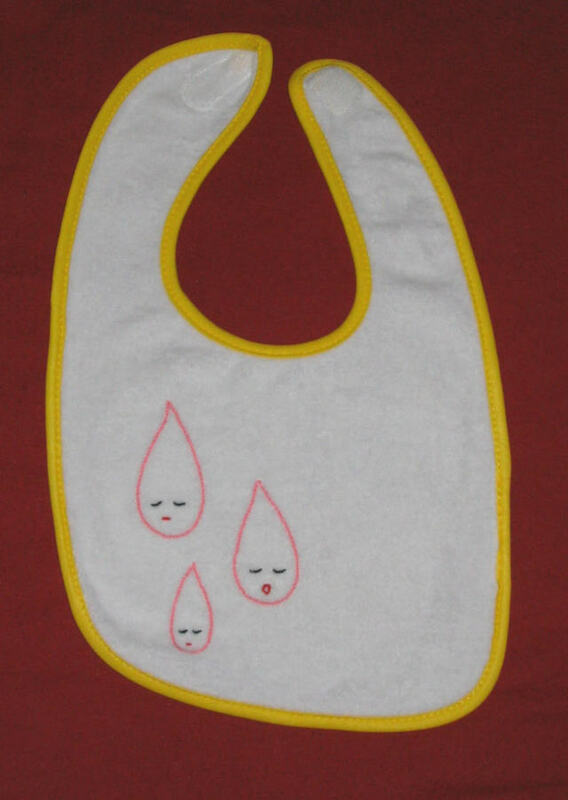 look at how cute the sleep tears are on a bib! i knew they'd be adorable, but i had no idea they'd be this adorable. of course, because they are on a bib, they could be sleepy drops of anything, including lunch. it can adorn your fabulous baby for only $15! 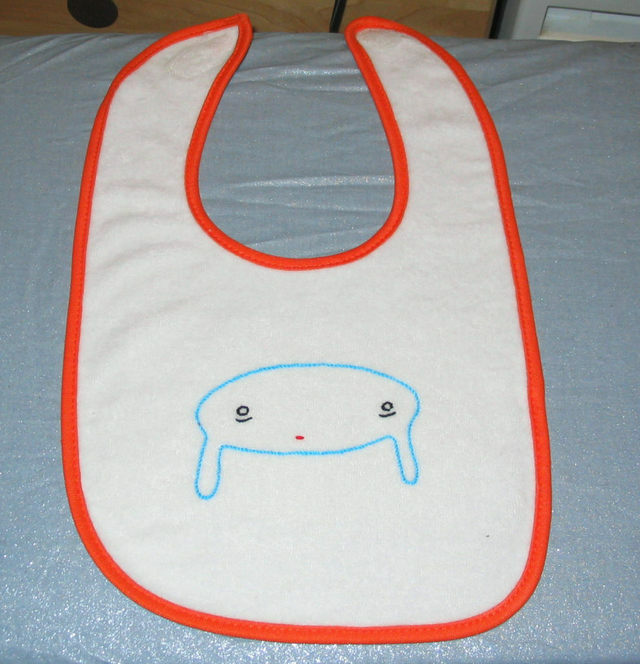 it's a new bib, with a small shroom friend for your baby. i just finished it, which is why there's still some pink on it from the transfer pencil, and why the photo isn't the best. once i get it all washed and dried, i'll take a much better, professional-style photo. of course, if you can't wait that long, you can buy it now. i'm not going to stop you. the oranger monster is now blue, and on a bib! he can adorn your sweet little monster for only $15. hey, guess what? in the past two months i quit my old job and got a new one, and in the process got very behind on updating the site. that's not like me, and i'd like to apologize. now that i'm all settled, though, and not worried about paying the rent i've got a lot of new ideas and some new things to show you. 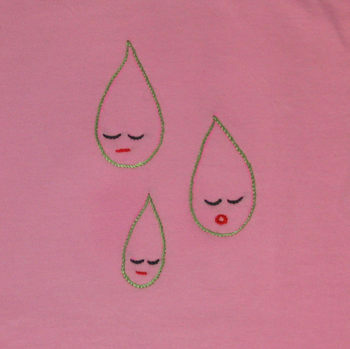 these are the sleepy tears. 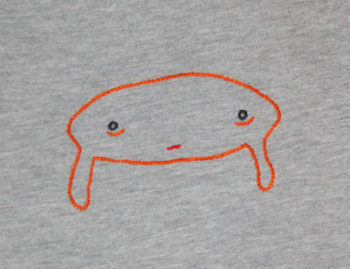 i made a few shirts with this design, based on a small stuffed mini i made. 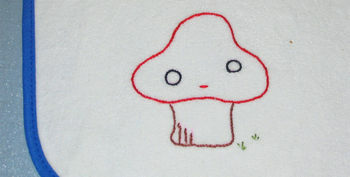 here's the detail of the little guys, with one yawning. 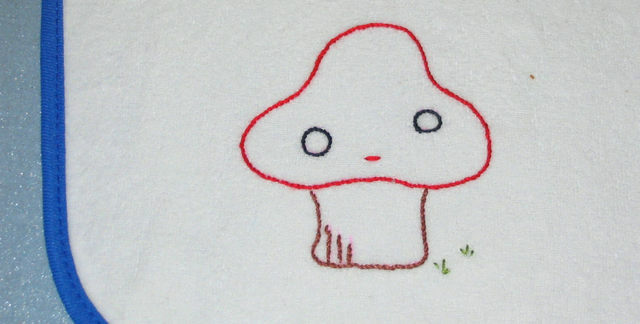 these are the small stuffed pins that started it all. on the left is the yellow guy my friend dana made me (named squish) and on the right is the first sleepy tear i made. they're both made out of felted bits of old sweaters, and have a pin on the back so you can wear them on a sweatshirt, bag, ect. dana's is much nicer on the back than mine is, though. i got a bit rushed and wanted it done now, so that tear only has a safety pin sewn on the backside. after i made the first shirt with sleepy tears on them, i made this shirt, which in hindsight reminds me of squish. he's a sort of pensive little man, but sweet. 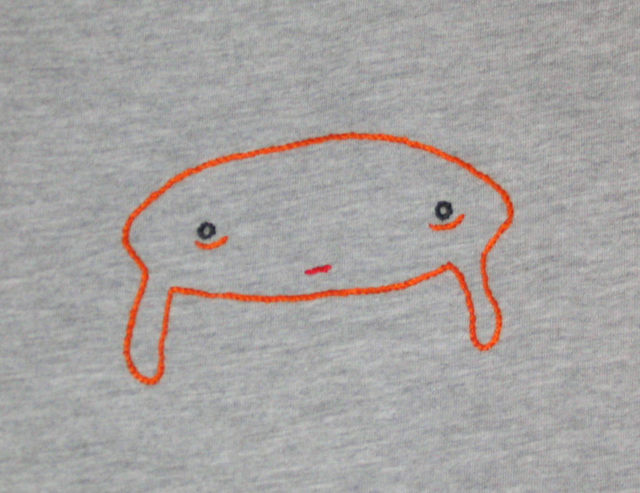 both are embroidered on american apparel kid's shirts, size 4 (which fits children from 35 to 41pounds). 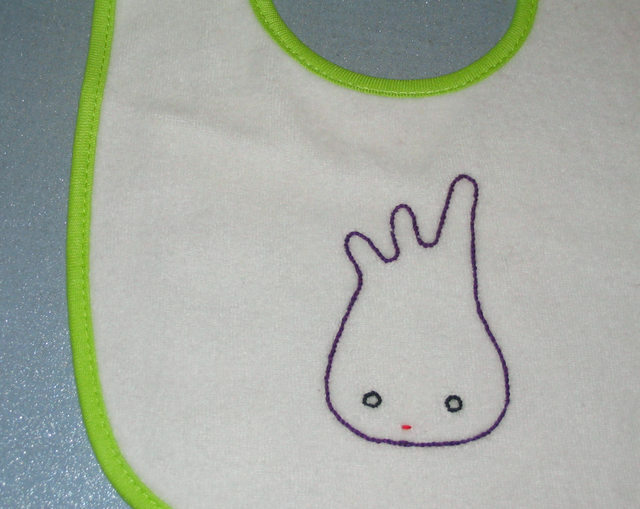 both can be found in the pinprick baby gallery! p.s. i added a notify list as well as easy to use paypal buttons. hopefully that will make the site much more easy to use and more fun. let me know if you encounter any troubles with either, okay?